For other uses, see Independence (disambiguation). Whether the attainment of independence is different from revolution has long been contested, and has often been debated over the question of violence as legitimate means to achieving sovereignty. In general, revolutions aim only to redistribute power with or without an element of emancipation, such as in democratization within a state, which as such may remain unaltered. For example, the Mexican Revolution (1917) chiefly refers to a multi-factional conflict that eventually led to a new constitution; it has rarely been used to refer to the armed struggle (1821) against Spain. However, some wars of independence have been described as revolutions, such as the ones in the United States (1783) and Indonesia (1949), while some revolutions that were specifically about a change in the political structure have resulted in breakaway states. Mongolia and Finland, for example, gained their independence during the revolutions occurring in China (1911) and Russia (1917) respectively. Causes for a country or province wishing to seek independence are many, but most can be summed up as a feeling of inequality compared to the dominant power. The means can extend from peaceful demonstrations like in the case of India (1947), to a violent war like in the case of Algeria (1962). Autonomy refers to a kind of independence which has been granted by an overseeing authority that itself still retains ultimate authority over that territory (see Devolution). 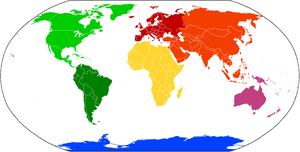 A protectorate refers to an autonomous region that depends upon a larger government for its protection as an autonomous region. Sometimes, a state wishing to achieve independence from a dominating power will issue a declaration of independence; the earliest surviving example is Scotland's Declaration of Arbroath in 1320, with the most recent example being Azawad's declaration of independence in 2012. Declaring independence and attaining it however, are quite different. A well-known successful example is the U.S. Declaration of Independence issued in 1776. 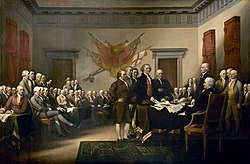 The dates of established independence (or, less commonly, the commencement of revolution), are typically celebrated as a national holiday known as an independence day. and 1945 to circa 1979, when seventy newly independent states emerged from the European colonial empires and collapsed nazi German Reich. ^ Independence from the United Kingdom. ^ a b Part of Transcaucasian Region, at the crossroads of Europe and Asia. Physiographically, Armenia falls entirely in Western Asia, while Georgia and Azerbaijan are mostly in Asia with small portions north of the Caucasus Mountains divide in Europe. ^ Partially recognized de facto self-governing entity. It is recognised by 102 UN members the Cook Islands, Niue and Taiwan. Claimed by Serbia as the Autonomous Province of Kosovo and Metohija under UN administration. ^ An independent state in free association with the United States. ^ Benjamin, Walter (1996) . Walter Benjamin: Selected Writings, Volume 1: 1913–1926. Cambridge: Harvard University Press. 236–252. ISBN 0-674-94585-9. ^ "Kosovo" (PDF). Archived from the original (PDF) on 2008-02-16. Retrieved 30 July 2015.